A tour of a working farm is something everyone should experience. 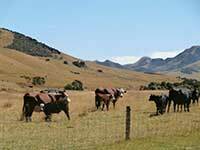 By staying at Pahau Downs you have the opportunity to tour a working Sheep and Beef station of 6000 acres with beautiful rolling downs as well as hill country and the river bed of the Pahau River which runs through the property. The farm tour takes several hours. On the tour guests will have the chance to get out onto the farm in a four wheel drive vehicle driven by the owner. During the trip, view the spectacular scenery of the Amuri Basin, the mountains at the back of the farm and get close to some of the five and a half thousand sheep and two hundred and fifty beef cows. This is free of charge for guests that are staying two or more nights. The charge for guests booking a single night is NZ$185.00. 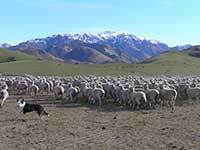 As Pahau Downs is a working farm, the tour experience will differ depending on the season and weather. Farmstay guests will have the opportunity to see things as they really happen.